Did you know that Malaga is one of the most popular locations in which to learn Spanish? Our students choose Malaga for its Mediterranean climate, its beautiful sandy beaches and its traditional Spanish culture. Don’t forget, Malaga is also birthplace to Picasso, and home to flamenco! You’ll really enjoy the Mediterranean lifestyle during your Spanish course in Malaga – from relaxing on the beach to enjoying long lunches in the seafront cafés, you won’t want to leave! We have two schools in Malaga. Our Malaga (Premium) school is just 10 minutes’ walk from the beach, and occupies its own campus, with everything you need right at your fingertips. Our Premium school in Malaga stands in its own private 'mini-campus' and is located in a stunning residential area of the city, just a short bus-ride from the city centre. The school itself is comprised of 25 air-conditioned classrooms, a self-access study centre and a student lounge. On the campus you will also find a swimming pool, cafeteria, dance studio, a high standard On-Site Residence and free Wi-Fi throughout the premises. Our Malaga Premium offers a great variety of courses, available to students of all levels! The most popular course option is the Intensive course which includes 20 Spanish lessons each week, which are taught in small groups with a maximum of just 10 students. This course covers the full range of language skills including speaking, listening, reading, writing and grammar, and is a great option if you want to improve your overall understanding of, and confidence in using Spanish. If you want to maximise your lesson time, the school also offer an Intensive course with 24 lessons each week, and Super Intensive courses which include either 24, 26 or 30 lessons each week. We also have numerous start dates every year for students wishing to combine a Spanish course with lessons focusing on Spanish cookery, salsa and flamenco dancing, as well as our popular Club 50 course which combines a programme of language lessons and activities offered exclusively for students aged 50 years plus. For students hoping to obtain a qualification in Spanish as a foreign language, DELE preparation courses are available. We also offer Business Spanish courses which focus on language skills required in the working world and cover topics relating to communication in the workplace, such as personal introductions, presentations and participating in meetings, as well as lessons focusing on Spanish business culture and practices in areas such as human resources, market research and product analysis. Teachers of Spanish may be interested in our Teacher Training courses, which combine Spanish and culture lessons with lessons dedicated to teaching methodology, technology in the classroom, materials and interaction in the classroom. We also offer Erasmus+ programmes for teachers in Europe, and can assist with applications to obtain funding. Please contact us for more information about this. Private lessons can also be arranged, with start dates for students of all language levels, on every Monday throughout the year. All 114 rooms in the residence have a private shower and toilet. With its excellent on-site facilities and first class student residence, this is undoubtedly the best-equipped of all the Spanish schools in Malaga. The school and residence are both located within walking distance of the beach. If you would prefer a higher level of interaction with Spanish people, we can also arrange accommodation with one of our carefully selected host families. This type of accommodation is available on a half board basis, so your hosts will provide two meals each day. We also offer shared apartment accommodation, where you will live with up to six other students studying at the school. This is the best option for students looking for self-catering accommodation as you will have access to a fully equipped, shared kitchen. In addition to an excellent Spanish course, the school provides a guided tour of Malaga and optional Flamenco or Salsa classes, regular parties, film evenings and half-day and full-day excursions to Granada, Cordoba and Seville. There are also weekend excursions to Morocco. Fly directly to Malaga. Taxis are readily available from the airport. If you would prefer, the school also offer a private transfer service from Malaga Airport. Average score for our school in Malaga (Premium) based on 101 previous client reviews. Really enjoyed the lessons, the teaching was very good. My accommodation was easy to find, nice and clean and welcoming. Really enjoyed my time in Malaga, nothing bad to say. I have attended for one week at a time for 4 years. The school is in a rich suburb and is modern and well equipped. The teachers are friendly and enthusiastic. I enjoyed the free flamenco show. I take accommodation in the city centre in a cheap hotel as I like being close to tourist attractions. The teaching staff was very competent. I learned a lot. The excursions were a nice way to see other areas of Spain. I stayed with a family, the hostess was very helpful and found time to chat with me on a regular basis. It was a great experience and I would recommend it to others . I felt I progressed well even though I only spent one week there. Very like basic college accommodation, our room was fresh and good quality. Well organised, excellent teachers, small class size of appropriate standard, convenient location. Daily extra cultural activities/visits. It was an amazing course! I would definitely go back to Malaga. The teachers were friendly and helpful. I started as a complete beginner and after 4 weeks I had a strong base for my Spanish. The apartment provided by the school was excellent. Although the walk involved many stairs, the apartment was worth it. This was my second time there and if anything it was better than the first. The main teacher Maria José was perhaps the best I have ever encountered, but the whole experience was first rate. The accommodation was Spartan, but it had everything that I would require. I believe that the Institute has more comfortable rooms and I'll ask about one of these next time. All staff were approachable, profesional and willing to help with any problems ( didn't have any). Accommodation was simple, and although basic all essential requirements shower, desk etc were there and it was spotlessly clean. Our "teacher" was Yolande. She was ace - though as I say all staff, my little group and I engaged with were excellent. The teaching is excellent, fun and informative, in a lovely facility and I met interesting students of all ages from other countries. The school is quiet at this time of the year. The extracurricular activities are limited due to too few numbers of students. The weather was quite cold but it was January/February. Only attended for one week, teaching excellent, would have liked to have been stretched a bit more. Accommodation clean, adequate and comfortable. I loved the fact that all the staff spoke Spanish slowly and clearly. The restaurant staff were excellent, efficient and helpful. The cultural outings were interesting. I found the week enjoyable after the test. I thought the week was excellent value for money and the school is in a lovely location. The teacher was brilliant and coped well with the different abilities in the class. Very well organised and delivered. My intermediate/advanced course was just want I wanted. I liked the frequent change of teachers. They communicated well with one another and all were very good, some exceptional. The campus is lovely with a pool and reaasonably priced cafe/bar. It's a short bus ride or long walk into the centre. The course was excellent. Modern buildings, small classes, enthusiastic teachers. Also excellent facilities for self study. A bar and restaurant and a friendly atmosphere. The extra curricular activities were frequent, varied, interested and well organised. I would recommend this course to anyone. Very positive experience. Teachers very sympathetic to their learners . Relaxed atmosphere in classroom was conducive to learning. Room in accommodation very well serviced and clean . Excellent shower etc . Very impressed with variety and quality of after class activities. The only thing that was difficult for me was the 8.30 start! Unused to continental ways! You undersell yourself. I did not know the school and course would be so good. You should let potential students know more about what is in the programme and what the price they pay includes because it is very good value for money. I had a single room in the on-site residence, which was small but comfortable and functional. I was on the 5th floor which is recently decorated, the others appear quite dated. All beautifully clean with clean towels daily. The restaurant onsite is very good and reasonably priced. Plenty of local tapas/restaurants nearby. Swimming pool a bonus! I was placed in the beginners over 50's Spanish class which worked out perfectly. The tutors and other students were all very friendly. I was in one of the student rooms on site which was small but had a shower and toilet. It could get noisy at night but that was to be expected as there were so many young energetic students on site. The whole experience was very enjoyable and I plan to go again sometime in the future. Our group was only in the school for one week, this being the maximum that we could manage together. Our teacher tailored our week's teaching to one specific area which I believe was highlighted on the initial test. I found sections of the subject so much clearer afterwards and I am grateful to Ana our teacher for her hard work and patience. My room was basic but adequate for the purpose required. I am 73 years old now and have become accustomed to more comfort. The room was always clean and fit for purpose. One week was far too short. I would like to return perhaps next year and stay for longer. The course was excellent. I do not like tests and did not do as well as I could have, however I was in the correct group. There are not many English students I was only 1 of 2 , my class consisted of four people Dutch, German and Swedish. I enjoyed the fact that everything was taught in Spanish and I was surprised that I understood 90% of it. The tutors were great, over the two weeks we had three different tutors, once all three in three hours but mostly two a day. A very good course, all the staff of the school and in Club Hispánico were friendly and helpful. The bar/ restaurant meals were good and the price was reasonable. Good choice on the menu. The area around the school has supermarkets, restaurants , tapas bars etc. An excellent school. The staff were very professional and the course was well run. I will certainly go again. Very private, quiet and clean accommodation, a standard room with everything that was needed. It was a great opportunity to meet and speak with students from all over Europe and the USA. Good facilities, restaurant, bar, pool and terrace. Nice food also. It was like a friendly hotel with classrooms. Hi, yes just back from a great course in Malaga. Everything was excellent, including all the teachers. My host family was lovely and only 10 mins from school. I certainly can recommend this place to anyone and it was very well run.Thank you for all your help with all my questions and was certainly not disappointed with anything. Also cookery course was great!! I was very happy overall with the course, I thought it was well structured and the staff anf teachers were very friendly and helpful. Very happy overall, Enjoyed course much more than expected. I have never enjoyed "school" so much. The teachers were all very good, kind and friendly. The course was well structured and the sessions broken by short pauses so that 4 hours of lessons in a morning were easily manageable without feeling tired by the end of them. I only used my room for sleeping and changing so was content with it for the price, it was basic but adequate. The residence was conveniently situated next to the school. The food in the cafe was reasonably priced and tasty. Both staff and students were friendly and I can't wait to go back again. This was the best holiday of my life. The school put me in exactly the right level of class for my understanding and I was amazed at how I was able to understand most of the grammer classes, even though they were taught entirely in Spanish. I now understand grammer that I never even leaned in English! My room was simple but perfect for my needs. Having a desk, a lamp and shelf space for books is very useful. Also, the in-room safe is handy to save you having to keep going to Reception. The teachers were very energetic and helpful. the camaraderie between students was great and every worked and co-operated together. Very good course, I learnt a lot. I found that the course was very well organised, and all the teachers and staff were friendly, helpful and very enthusiastic. I had an amzing two weeks, and met people that i will never forget, and that i will stay friends with for life, so thank you! Extremely good in the end - first few days were very difficult for me as the whole envioronment was very new i.e. lessons only in Spanish - great at the end but 'muy dificil' in the begining. First class teaching, excellent content - intensive but productive. Lessons of 50 minutes then a 10 minute pause worked really well. I found it necessary to spend at least 2 hours a day on the homework, and this seemed to be the norm. The executive room was better than I had expected and the standard was very high. I was delighted. For me as a complete beginer I initially found the couse intense and demanding.Having decided to stick at it I can now look back and appreciate how much I have learned and retained over the 4 week period. For someone with a only a few words of Spanish, I now have a recognition of approximately 400 words. The teachers were of a high standard and passionate about their language.I enjoyed my stay and would not hestitate to return to Malaga. An experience to treasure. Muchos Gracias. I really enjoyed the course and can now speak proper sentances in Spanish. The teachers were very professional. the lessons were challenging but we were encouraged to speak as well as complete the homework. a great experience. The activities were interesting and we were lucky enough to be in Sevelle at the time of the Ferias. I would recommend this to anyone who wanted to learn a language. I enjoyed my time in Malaga very much, the teachers were great, facilities good and I would recommend it to others. Accommodation was a bit dated in parts but perfectly adequate and I enjoyed my stay. After spending a week at the school they rated me at higher intermediate. It has taken me 2 years of studying to attain this level but after just one week at the school this year my confidence in speaking and listening to Spanish has improved more than I could wish for. If you really want to learn a foreign language you should attend one of these schools. They can provide you with an insight to the language and culture of the country of which you are studying. It was really nice, the school is situated in a beautiful place. you can do your homework on the beach and study around the swimming pool! Very good teachers. special topic for each day. Lot of speaking course really good. The course was excellent; the teachers professional and fun, and fully involved with making it a good experience for everyone. My executive single room was everything I had hoped for and more, even a little cava and fruit on my arrival. It's a great set-up. The standard of teaching was excellent. All the lecturers were approachable and clearly very experienced. They explained the grammar ponts clearly and didn't move on until everyone understood. The atmosphere in the classes was very relaxed and I enjoyed all of them. The salsa was great. Herman knows every dance there is and managed to teach everyone the steps with supreme patience ! I really looked forward to his class every day. Before coming, I was a little apprehensive about being on my own but was made to feel very welcome by everyone. Course was excellent; welcoming introduction and good assessment of individual language ability. Relaly enjoyable way of emersing into Spanish with a variety of teachers and methods of learning. Accomodation was basic and fine if you are still used to student accomodation but not if you are a litle older. Once discussed with Manager I was allocate a more comfortable executive room. High quality teaching. School provided perfect environment for Spanish conversation and development in language skills in general. Best feature was probably the cultural programmes, which I really enjoyed. The school ability testing also worked very well. Would take on a longer course in the future! Fairly basic accommodation in the [school on-site] building but clean and adequate - cleaned daily. An excellent course, I would higly reccomend it. The accommodation was Very good, with an amazing view. I would higly recommend this course. Loved my time in teh school. Amazing location, great language course and beautiful weather with great people. Pitched at right level. Teachers always on time and I liked having a lot of different teachers, felt I learnt a lot. Would have been nice to have a few arranged in the bar at night, possibly quiz or local music to help students to meet others. Very well organised with in house course material, a new exercise book for each week containing organised units per day setting out clear goals. The teachers were motivated and enthusiastic and made us all feel welcome. I stayed at club hispanico and it was like a university halls of residence attached to the school, very convenient with excellent facilities. I thoroughly enjoyed the school and the whole experience, the facilities at the school were fantastic and the location appealed to me. It was a dorm room: spare but comfortable. The only thing I really missed was a hair-dryer but I adjusted. The building itself was lovely. I was surprised how many activities there were. Not only was there the trip to Morocco but excursions to nearby points of interest and movies once a week. The course was a little more intensive than at previous schools. All seemed very well organized. The rotation of teachers was good. There was an end of level B1 2 hour exam which was a good marker of progress. The study facilities were good. I booked my own accommodation in a city centre hotel. Despite being in the winter season there was a good number of fellow students with opportunities for organized activities and making friends casually. We got a lot of chances to play games in Spanish such as 'Apples to Apples', Hangman, etc which meant we were learning without realising it. We did a lot of speaking practice on topics we were actually interested in and which we would find useful when talking to people in Spanish. I thought the lessons were very well designed and everybody got a chance to practice the language and have a go at everything. The room was really nice and I loved having my own balcony which I could sit out on. The wifi connection was excellent although I have heard this was not the case in all rooms. I would have liked there to be air conditioning though as it did get very hot, and I often found that the cleaners came in just after lessons finished which was not great timing. Really good location, in a village just outside of Malaga so that we were not right in the city but it was easy to get to for shopping or nightlife, and we were just a short walk from the beach! Also the fact that lessons finished at 12.30 gave us almost a whole day to relax and enjoy experiencing the country. For the cafeteria food, I thought the breakfast muffins were excellent but there could have been more variety at lunch and dinner. Was put in a group at exactly the right level, so could follow but was stretched. Good variety of activities, excellent teachers and a lot of conversation. Teh accommodation was clean, comfortable and had good facilities. Plenty of activities for the 50+ group. Restaurant on site very good. Course was excellent. The teaching was exceptional! A very professional language school. The initial assessment ensured I was placed at the right level. Course material is very good. The pace and volume was pressing but not over whelming. The mix of grammar, comprehension and practical skills was also well balanced. A very rewarding experience. Overall the accommodation is very good in a very nice location. Good facilities and the Bar / Restaurant was very good, I was half board and food was fine. All the staff are very friendly and helpful. Overall I found this course exceeded my expectations. The school is a very professional teaching facility with very capable staff in all areas. The profesores made it such good fun. They were very animated made grammar sessions much more interesting. My class was a particularly good mix, leading to a great ambiance within the classroom and enabling us to have interesting discussions. The accommodation was good. Very convenient. However the single rooms really are small. The upside is that you are not likely to be in your room very much and it did have everything that I needed. As a fifty something, I thoroughly enjoyed the social aspect. Everyone is open to making friends and talking. It was a great way of meeting people of a range of nationalities and getting to know a bit more about the wider world. The combination of the school, swimming pool, accommodation and proximity to the beach and city made it the perfect place to go. The Language course was very good. It was very efficiently run and the quality of the teaching was very good. The professors were helpful and very approachable. The room was satisfactory and good value for money. It is in a very nice location, handy for amenities such as shops and cafes and is a short walk to the beach and not far from central Malaga. The complex was very good with a lovely pool and a good restaurant and very good learning facilities. The extra activities offered in the school were very good. The dance teacher was excellent. I liked the course. Teaching method was well organized, teachers were skilful, nice activities besides class, and school staffs were friendly. I always felt comfortable to stay in the school. I stayed in a shared apartment. Enough size, secured, house utilities complete. 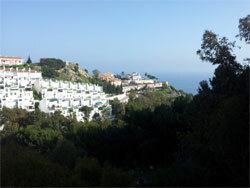 School is located on the hill with beautiful scenery, and apartment is located near the beach. I also liked that. Thank you, Apple Language for having good school selection. The teachers were 'muy simpatico' and keen to help. As a beginner at 60 years of age I was never made to feel 'silly'. As a vegetarian I was a little worried about how my hostess would cope but she couldn't have been more helpful. I ate more and better than I normally do at home! I absolutely loved it! From the moment I arrived, staff were friendly and everything was really organised. The course was just what I needed. I was there for 4 weeks so I had the chance to progress to the higher class. Teachers were friendly and easy to talk to. Regarding the accommodation, I was amazed that there was a maid service. Wow. I was in a shared room and my roomate was really friendly and Swedish. The room was big enough for both of us and so was the bathroom, which included a bath AND a shower!. There was even a fridge! I was really impressed with the accomodation. I would just like to say thank you for an amazing 4 weeks away from home. There was so much to do and so many people to meet that I didnt miss home once. I will definitely recommend this course to a friend and I am definitely going to do it again in the future. I really enjoyed everything about it. The classes were really fun but also really challenging - I was put in at exactly the right level. I also thought that the activities were fun and also interesting, I especially liked the trip to Granada and the bicycle tour around Malaga. The woman I stayed with was really nice and friendly and every thing about the accommodation was good. I really, really enjoyed my time in Malaga, everyone was really friendly and I made some really good friends as soon as I arrived. I think the summer course setup was really good, as it meant you didn't have to get up early after a late night out. The teaching was really good and all of the staff were very friendly and the teachers definitely keep you entertained, even when looking at all the variations of the subjunctive tense! I would recommend this course to everyone! This was the eighth time that I have attended a course at this school in Malaga. I think that sums it up! The teaching was excellent and I would like to try another Club 50 course in Spanish in the future. Interesting experience, extremely good teachers, hard but enjoyable work involved in the course. The accommodation was very satisfactory, comfortable and house-keeping staff were good. Extremely good cultural visits. Tutors and course content excellent. Conducted at a comfortable pace whilst still covering a lot of ground. Atmosphere in classes relaxed and fun. Tutors encouraging but not pressurising. Everything needed to prepare own meals if required. Very spacious and comfortable. Quiet with own entrance and small private garden. Next to the school so very convenient. Hotel standard maid service. Bed made every day, apartment cleaned and fresh towels left. Generally the course, the tutors, accommodation, excursions and staff were excellent. My trip to Malaga was just fantastic. The teachers at the school along with the staff were great and so helpful. I learned more than I thought I would have. I met so many amazing people at the course and the whole experience was just fantastic. My accommodation was great value for money. The rooms were big and spacious and very clean. The people I shared the apartment with were great too. The whole trip was so good that my friends and I are going to have a reunion there next year. The course was very well organised and we were both placed in classes very well-suited to our abilities. The accommodation was excellent. Walks along the beach after Spanish! On Top of the World in Malaga! Suntan and Spanish in Malaga! Where there is an end, There is a new beginning!